If you have ever gone camping, then you will realize that the difference is always made by the little stuff that we often tend to ignore. We usually concentrate on the more conspicuous camping materials such as the tents, straps, and hammocks among others. The carabiners, however, are always considered as “little details” and will rarely cross our minds. The hammock carabiner is an important thing when it comes to the suspension of the hammock strap. You are likely to get it rough setting up your camping site if you do not have these stuff. You may as well remember to carry them, but unfortunately, you might later come to realize that you made a wrong choice and they are not safe and stressful. A wrong choice of these carabiners can ruin your camping experience. You need to select the best. You need to be safe during your entire camping time, and that is actually what the very best of these products will offer. After careful evaluation of the carabiners currently available in the market, we came up with the very best for you. You can choose from these products discussed below depending on your preference and needs. They are as below. 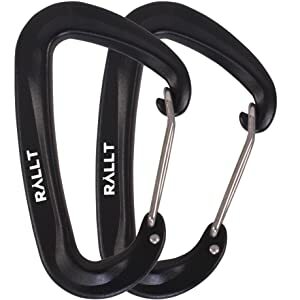 The Rallt 10 KN is the best carabiner available in the market today. Talk of quality, safety, versatility, ease of setup among others combined in a single product. What else could you be looking for apart from these qualities? Nothing much I believe. This is the crème de la crème carabiner product. These wire gate products are made from aluminum. They have a wide range of uses such as hiking, camping, backpacking, fishing and for hammocks which is basically what this article is about. They are D-shaped. Actually, the shape is not accidental but has been designed in such a way to keep the carabiner strong by ensuring that weight is concentrated on the spine which is always straight. The carabiners are rated for weights of up to 10 KN which is approximately 2,248 pounds. For the one-handed quick opening, they have wire gates. This eliminates the accidental ripping and snagging of materials. The carabiners are each weighing 20 grams with measurements of 8 centimeters in length. Unfortunately, these carabiners cannot be used for climbing. They come in packs of twos. After a hammock breakdown, just add to the keychain and clip to your belt loop. It is always important to have a backup for every product you wish to buy. The Live Infinitely 12 KN carabiners come in packs of four and can sustain much weight, unlike our top pick which makes it a perfect alternative pick. If the hammock is to carry more than one person without compromising on safety, then this is the product you need. The carabiners are D-shaped and are made of the 7075 aluminum alloy that is rust resistant. You can, therefore, use them for any camping or outdoor activities. Easily convert them into your key ring if not being used for suspension of the hammock. The carabiners have been designed smoothly and cleanly to prevent any snagging and tearing of your backpacking gear. Your backpacking gear will last longer and could be used for more camping activities in the future. You can easily set up your hammock using these carabiners since they have flip spring gates that can allow for quick and one-handed operations. These products weigh 0.7 ounces. This is courtesy of the aluminum alloy used to make them which is extremely light. You can, therefore, go hiking with them without feeling any kind of weight. Weight is quite a burden that should be avoided at all costs when you go hiking. With every biner capable of holding weights of up to 12KN (2,697 pounds), they are strong enough and will not let you down regardless of whichever weight is placed on the hammock. They cannot budge even on weights close to those of rhinos. To show the confidence that the manufacturer has on these products, they have a lifetime warranty against deforming, breaking, bending and any other physicality problem. You will surely get satisfied with their customer service which is always reliable when called upon. 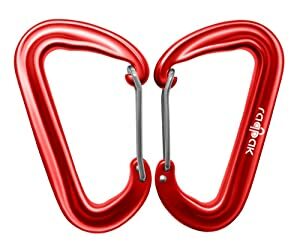 Raqpak is a brand that has been known to produce high-quality carabiners for quite a long time now. You can surely trust them. The carabiners are another great pick you can make if you miss on the two products mentioned above. The experience is more or else the same. These products are strong and long-lasting. They can withstand a force of up to 12 KN and are, therefore, suitable for the suspension of your hammock during camping. They are, however, not suitable for climbing. You can look for carabiners that can sustain 24 KN for climbing. 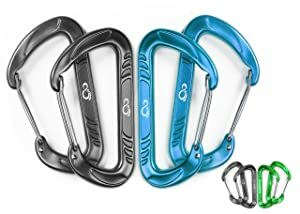 The carabiners each weigh 21 grams which makes them so light and can be carried over long distances without any form of fatigue being experienced. Their measurements of 3 1/8-inch long by 2-inch wide is small enough for compact storage. You can place them in the backpack, and the next time you will realize you had them will be when setting up your hammock. Snagging is a very common problem that is always associated with hammocks. However, these carabiners are made using an alloy of aluminum which is smooth to make them snag-free. They are at the same time easy to operate. The wire gate has a spring and hook link which makes it easy to open and close. If you are the type of person who gets so fascinated with colors, then this is the carabiner to look for. They come in various colors so you can choose your favorite from the variety. You can use it for other functions as you deem fit when not working towards having a well-suspended hammock. The D-shaped frame adds onto its strength as compared to the oval-shaped ones. They are sold in sets of 2, 4, 6, 8 pieces among others. 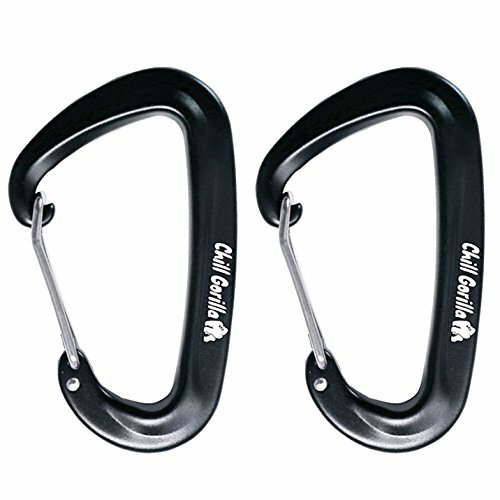 The Chill Gorilla is a brand that is known for the production of high-quality carabiners. These are another great pick you can always count on in the absence of the three products earlier mentioned. They will effectively help in the suspension of your hammock. These carabiners which are sold in pairs are made from the 6061 aluminum alloy which is mainly known for the manufacture of aircraft wings. The aluminum alloy is, however, strong enough and can be used to hold weights of up to 2646 pounds (12 KN). The strength that accompanies these carabiners makes them durable and can be used for camping in different seasons without replacements. The manufacturing material is corrosion-free. This adds onto its durability features. Each of these carabiners has a weight of 21 grams which is almost a negligible weight on your backpack while walking. The 8 cm measurement is small enough for easy storage. The versatility that this carabiner comes with makes it perfect for hiking, fishing, camping and most importantly for the support of hammock. They are designed in such a way that they are snag and tear free. The wire gate has a flip that makes them easy and quick to operate on one hand. This saves a lot of your setup time. The Chill Gorilla beats a lot of competitors based on its size and the hassle-free warranty which requires online registration on their website. Their reliable customer care is always on standby to help answer your queries within 24 hours. The Legit Camping LGT-3001 has taken the carabiner experience to a whole new level. These carabiners come together with the hammock straps for easy setup. The 12-foot straps give you the safety you require when relaxing in the hammock. The straps have been made from a high quality and heavy duty polyester material. They are made thicker, stronger and above all durable. Tough stitching is very necessary when it comes to strength, and it has been taken care of with these straps. This helps improve your security and safety. These straps are strong enough to withstand weights of up to 400 pounds each even in the most extreme of weather conditions. 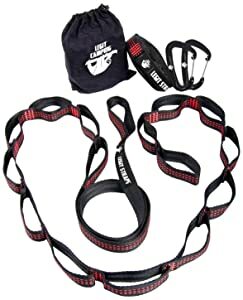 These straps are accompanied with wire gate carabiners that are made from the highest quality aluminum. The carabiners are rated at 12 KN. All these have been designed with the lightest weight possible for easy transportation from place to place. The setup process has been made easier and safe with these materials without compromising on safety and strength. Each strap has up to 20 support loops which make hanging them incredibly easy. The strap together with the carabiners can be used for other functions such as backpacking and hiking. There is no worry about stretching as you will wake up and find the hammock exactly as you had set it up. Have you realized that there are some common features in the above products? These are what are used to settle on the best carabiners. Not every carabiner has them. So you need to be extremely keen whenever you are shopping for carabiners. You can look for these features discussed below. Most carabiners are made from aluminum or stainless steel. The steel carabiners are more durable since they are stronger. However, they are heavier and are not usually recommended for camping purposes. This leaves us with the aluminum-made types which are basically what we have talked about in this article. The aluminum carabiners are anodized in most cases to make them free from corrosion. This makes it even possible to have them dyed with different colors. The layer is thin and does not add any weight at all to the carabiner. Aluminum alloys are known to be lightweight and carabiners made out of them are automatically light. This is so important especially when you have to carry other stuff in your backpack. You will walk for longer distances without feeling fatigue as a result of the carabiners. An ideal carabiner for hammocks should weigh less than 40 grams. If you come across a better one that weighs more but not to the extent that the weight becomes a major issue, then you are at liberty to buy it. The choice is yours to make. There are still innovations aimed at improving on the gates. The common types of gates you are likely to come across are the solid stock gates and the wire gates. The solid gate carabiners are keylocks. This means that its nose will latch on the groove that has been made on the gate’s barrel. The solid gates are at times dangerous when not properly clipped. If you have to buy solid block gate carabiners, ensure that they have key locks on the bottom and top as well. The wire gates are the most preferred since they are lighter. This gives you the freedom to carry other materials that will be crucial for your camping. The wire gate carabiners are also not prone to icing like the block gate types. They are, therefore, ideal for use in extremely cold weather conditions. Being that the wire is so narrow, you are likely to have a larger opening of the gate. The wire gates also minimize on gate flutter when there is an accidental fall. The disadvantage that the wire gates do have is the exposed notch that the wire is meant to latch on in the nose. There are still innovations to come up with more effective hybrids though. The strength of your carabiner is what determines the amount of weight it can handle. The strength is not always the same across the carabiners. You should use your weight plus any other person who will be accompanying you to the camp as your reference point. Most carabiners used for the suspension of hammocks can withstand weights of between 7 KN and 12 KN. Apart from the general strength of the carabiner, another important strength that requires attention is that of the gate opening of your gear. This should be between 9 and 10 KN to prevent any kind of accidental gate opening. The carabiners come in different sizes. Some smaller compared to others. Look for standard-sized carabiners that will be easier and quicker to operate even on a single hand. The carabiners should, however, occupy the smallest space possible for easy storage. The carabiners can either be bent or straight. The “bent” ones always take on a D-shape. These shapes are the most preferred since they are easy to clip compared to the straight ones. You would probably like to have something that will not stress you while setting up your hammock. This is what to look out for. The carabiners do not have a standard price as every manufacturer sets their own price depending on the materials and technology used. The carabiners are also sold in sets that might make the difference in pricing. The sets are in 2, 4, 6, 8 and so on. You are, therefore, likely to experience these price variations depending on the packs in which the carabiners are available. It is, however, worth noting that most of them are affordable. It is a good practice to work within your camping budget. Do not strain financially for expensive carabiners when some cheaper ones can work even better than the expensive ones. Nothing is as important as your security and safety while camping. These two things make the Rallt 10 KN Carabiners the best hammock carabiner. They are versatile and will serve a wide range of activities when called upon. They are designed with D shapes that make them stronger to carry loads of up to 2,248 pounds. You cannot imagine that just a mere 20-gram thing can withstand such loads. They are also small in sizes which make them portable. Easy and quick setup of your hammock will save you a lot of time. They have wire gates that make this possible. You can do it by using just one hand. The gates are also smooth to eliminate accidental ripping and snagging of your gear materials. I have personally used these carabiners, and the experience was such amazing. I could not imagine how affordable they were. I enjoyed every bit of my camping. Do not afford to leave yours behind. They did not corrode even in the icing weather conditions that I went camping. What an experience! Have you ever used any of the hammock carabiners that we have reviewed? If yes, how was the experience? Which brand do you think you may buy for your next camping expedition? Do you have another brand in mind that you would like us to review next time?